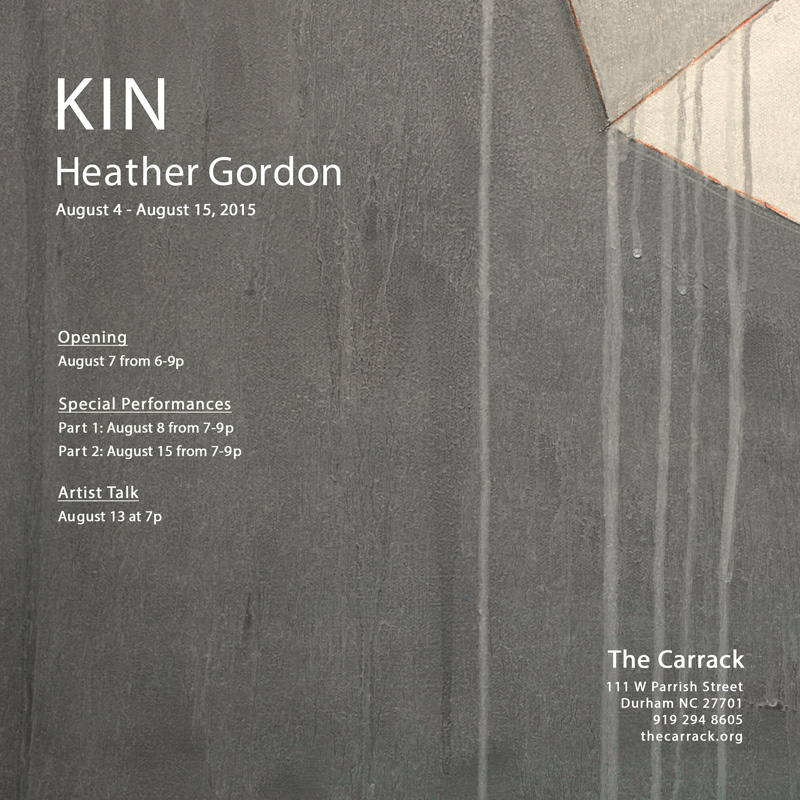 DURHAM, NC – KIN, a solo show from Durham-based artist Heather Gordon opens August 7, 2015 from 6-9pm at The Carrack and runs August 4-15th. This exhibition includes large paintings and a site specific installation on the floor and walls of the gallery in conjunction with a collaborative performance piece with Justin Tornow & COMPANY. The works in KIN represent the culmination of Gordon’s series titled “How To Fold My Heart” which describes the nature of relationships and the construction of identity through place and history. Using personal data, computational algorithms, and origami folding patterns, Gordon describes the narratives of her life as space, movement, and color. “Our lives exist in the company of others, within places, through the elasticity of time. I see my experiences as numbers, coordinates, durational moments, all set in soft relation, tucked into matrices, and mapping the shape of my life,” says Gordon. KIN includes large paintings on unstretched canvas, each an instructional map for folding the shape of the lives of herself and her family members. For example, “How To Fold My Heart : New Orleans” is a depiction of the geography of Gordon’s life set in relationship to the birthplace of her mother. Other large works include “Dynamics of a Binary System: Parts A & B”, a diptych of two folding patterns mapping the conflict, resolution, and orbital movements of intimate relationships. KIN event dates include the opening on August 7 from 6-9pm, an artist talk on August 13 at 7pm, and two performance dates, August 8 & 15 from 7-9pm for “The Value of Words #15/5”. The content of the performative work will be unique to each performance; movement vocabulary decisions vary between fully and partially determined, with sequencing and combinations of sections left to methods of chance. Born in 1967, Heather is the daughter of a financial analyst and an engineer. She received her B.F.A. from the University of Florida in 1990 and her M.F.A from New Mexico State University in 1995. In 2014, she was a recipient of a North Carolina Artist Fellowship through the North Carolina Arts Council. Heather is the 2015 winner of ArtPrize PITCH NIGHT Durham and will be exhibiting her installation project “Resting Place” in Grand Rapids this Fall. She lives and works in Durham, NC. Justin Tornow is an NC native, and lives in Durham, NC. She is the artistic director of COMPANY, a producer of the local artist series PROMPTS, and a co-founder and -organizer with Durham Independent Dance Artists (DIDA.) Justin’s work has been presented by the Triangle Dance Project, GSO Fringe Festival, DUMBO Dance Festival, CoolNY Festival, 2012 Philly Fringe, and the NC Dance Festival. COMPANY is a contemporary dance company based in Durham, NC. By utilizing both composition and improvisation, and reconsidering existing ideas about movement and content, the goal of artistic director Justin Tornow is to experiment with the formality of modern and contemporary dance.